The last Fanfare was largely about a bus driver for Colts. Here's another Colts story, submitted by corps member Katie Peak. Everyone always tries to figure out the best plans for their New Year's celebration. Some people will go out to a party; some will stay in with family or friends. My family decided to do something a little different this year. 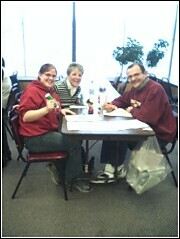 We drove to Dubuque, Iowa, to play bingo at the Colts Center. Many drum corps use bingo as a way to raise money for the summer. The Colts run their games three times a week, finding it helps their summer costs greatly. My mom has always talked about wanting to play bingo, which is generally followed by me teasing her to go to Iowa to play. Since I am a member of the Colts, I figure it would help my corps at the same time. So when we needed something to do as a family for New Year's, heading out to Iowa was the unanimous decision. As we got into town, I had to call the office to get directions (we got lost in Dubuque, again). Greg Orwoll, our director, answered and honestly didn't believe that we drove three and a half hours to play bingo. After assuring him a few times that we did just that, we got directions and found the Colts Center. As we walked in, people could tell we were new at this. Although the doors opened at 10:30 a.m., we did not arrive until about 10:45. All of the "regulars" were already set up. The first thing that caught our eye was the massive amount of trolls, daubers, and other good-luck trinkets. And even though the Colts have padded chairs, many people also had their own cushions for their bingo comfort. As we walked back to the office, we saw people had already started lining up to buy their lucky bingo cards. (They didn't begin selling cards until 11:30!) We walked back to the office and greeted the Colts staff with numerous questions. They assured us that they would keep an eye on us and help us through our new bingo adventure. My mom broke out in a sweat. We noticed that we didn't have any good luck trolls. Luckily, we got some from the Colts that we could borrow for the day. Then we saw that we didn't have any "daubers." You know, those things that you use to blot out the numbers. While some people had many different colors, we chose just to get one for each of us. Now it was time to find a place to sit. Have you ever walked into a new church and realized you were scared to sit down in case you were taking someone's seat? We had no idea where to sit! We found a table close to the bingo staff so they could help us if we needed it, but then learned a few minutes later that it had been reserved. We went searching again and the second table we sat at had heavy smokers. We eventually found the perfect table and hoped that it didn't "belong" to someone else. My dad and I went to go buy the game cards for the entire afternoon. An older woman came up to my mom and said, "Word has is that you are new to this. Good luck!" On the way back to our table, my dad dropped the stack he had just purchased. With three and a half hours of bingo games and three of us playing, we had a huge mess! As the clock was ticking away, we knew we didn't have THAT much time to figure all of this out. Luckily, we had some help from the friendly Colts. Not only did they get our game cards in order, they had to explain to us how to play. Along with the bingo cards, we were each given a "menu" of games that would be played on each card. A few different games were listed under each heading. My mom screamed, "What do you mean we play more than one game on each card?" Greg explained to us that we would begin playing the first game, and once a bingo was called, we would continue on the same card to make a different pattern. "Uh oh," Mom thought they were all going to be straight lines. We then noticed that the "regulars" were getting out their own tape dispensers. What was that for? The people who had bought multiple cards for each game began taping the pages together. They also taped their garbage bags to the table to dispose of used cards. One more thing we didn't have with us. As games started, we were surprised at how fast it was going. We could hardly keep up with our own cards and wondered how all of the other people could play pages and pages at once. Two ladies at a table next to us were playing about three pages, each with six bingo squares, while drinking soda, lighting cigarettes, and holding a conversation. My mom couldn't even get her 20-ounce Diet Pepsi open! We finally got the hang of it, but now we just needed some luck. I walked away that day being the big winner in the family. I had a bingo during two different games, winning a total of $100. Of course, the money stayed there as part of my tour fees payment. If only I could go back a few more times to make more money for tour. My family and I had a blast at our first annual bingo outing. I would suggest to anyone that they find out if there is a corps in the area and go play. It is a good way to help the activity, and a fun night out if you are looking for something to do.